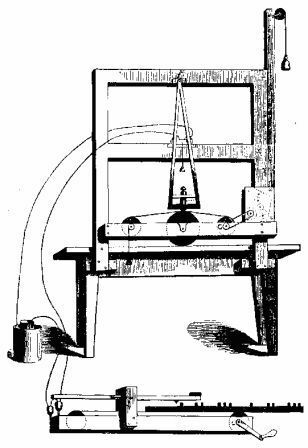 The non electric telegraph was invented by Claude Chappe in 1794 using a visual system called semaphore (a flag-based alphabet) that depended on a line of sight for communication. Cooke and Wheatstone were the first to introduce a telegraph worked by electro-magnetism; but it not able to mark down the message. Samuel Morse (1791-1872) was the first to successfully exploit the electro-magnet and developed and patented the first electrical telegraph in the United States in 1837. Samuel Morse and his assistant, Alfred Vail (1807-1859), developed the Morse code alphabet. 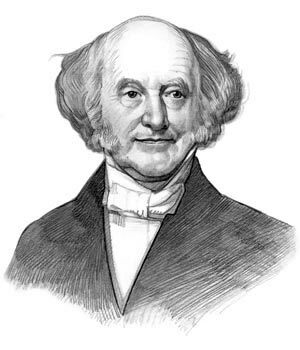 Martin Van Buren was the 8th American President who served in office from March 4, 1837 to March 4, 1841. One of the important events during his presidency was the invention of the Morse Code and the first telegraph line. Samuel Morse and his assistant, Alfred Vail, realized that if the man at one end of the line held his key down for only an instant, this impression would look like a dot. If the man held it down longer, it would look like a short dash. Samuel Morse combined these dots and dashes into an alphabet - see the picture of the Morse Code on your left. By combining dots and dashes to represent letters in the alphabet it became possible to send messages from a sender to a receiver using the Morse Code. The next stage was to simply add more codes using dots and dashes to represent numbers. The Morse Code was complete. The article on the First Telegraph provides an overview of one of the Important events of his presidential term in office. For additional info refer to Facts on Industrial Revolution Inventions. The following Martin Van Buren video will give you additional important facts and dates about the political events experienced by the 8th American President whose presidency spanned from March 4, 1837 to March 4, 1841.